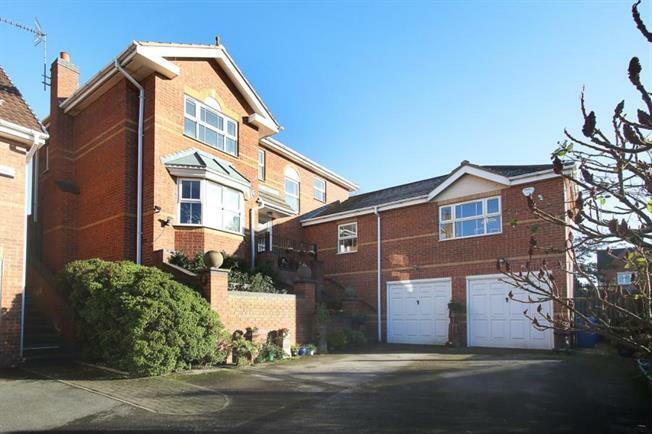 4 Bedroom House For Sale in Chesterfield for Guide Price £450,000. A generously proportioned and beautifully presented four/five bedroom detached property with double garage in the ever popular location of Barlborough. The entrance door leads into the entrance hallway which provides access into the very large modern open plan kitchen/dining room with. The doors from the dining area open fully to provide a light, airy and spacious feel. Access from the hallway to the study, two useful utility rooms and downstairs w.c. The family room provides a fantastic space on the ground floor with view over the front and rear of the property. Stairs lead to the first floor and the landing which provides access to the FOUR bedrooms including master bedroom with ensuite shower and bath, and family bathroom with w.c, wash hand basin and bath with shower above. To the front of the property there is off street parking and a double garage which provides ample parking. The garage has adjoining plumbed and heated workshop. To the rear the garden is partly lawned and paved. Barlborough is a sought after village location with a array of local amenities nearby and excellent access to the motorway network at the nearby Junction 30 of the M1, Sheffield city centre, Worksop and Chesterfield. Barlborough village centre provides a host of local pubs and the village church. This property must be viewed to fully appreciate the size of the accommodation on offer. To arrange your viewing please call Blundells now on 01246 208768.